Located in the heart of the Catskill Mountains, Scribner's Lodge is a 38 room hotel perched right opposite Hunter Mountain. What used to be Scribner Hollow Motor Lodge in the 60's, Scribner's renovated and reopened in 2016 as a place for modern explorers, complete with a downstairs restaurant with mountain views, a lounge and library, outdoor fire-pit, and uniquely designed suites. It's the perfect place for a weekend escape from the city and just a two-hour drive North of Manhattan. Our Catskill suite slept up to 6, with two double bunk beds and a queen, boasting mountain views from our private balcony. The rooms are light-filled, decorated with vintage rugs and custom-built furniture with each suite is unique in layout. "Since 1966, this building has welcomed and warmed the spirits of adventurers seeking refuge from their daily lives and explorers looking for something new." Downstairs at Scribner's own restaurant Prospect, you'll be spoilt with floor to ceiling mountain views where the bar flows into the restaurant area and you'll find seating nooks around nearly every corner. Serving up breakfast and dinner, with brunch on weekends, Prospect make use of the local ingredients available within the Hudson Valley- and there's no shortage of incredible fresh produce available in the region. With an impressive cocktail menu, après ski here melts into the dinner hour where if you hadn't ever experienced hygge, you're sure to have now. The common space features a pool table, board games, central fireplace and a perfectly curated library with new and old selections. At 5pm, you're invited to the outdoor fire-pit for Smore's-oclock, with everything you need already in your room and waiting upon check-in. Our two nights here were just right for recharging the batteries. With lazy mornings in the library and uno battles around the fire before dinner, Scribner's is a cosy retreat from the bustle of New York City and exactly the sort of Winter getaway we needed. Having a Zipcar on this trip gave us the freedom to drive around and explore the area. Aside from skiing & snowboarding at Hunter mountain, there's so much to do in the Catskills all year round. Using Zipcar you can reserve a car by the hour or the day, picking up your vehicle from one of many locations around the city. I've been using Zipcar for the past year now and it makes it really easy to run errands or take trips out of the city, especially as the gas is included and you don't have to deal with any paperwork or long rental car office queues. It's as easy as reserving a car online or on the app and then unlocking the vehicle with your card so you can hit the road. If you want to try it out for yourself, join here and you'll get $25 off your first reservation. Just a 40 minute drive through the Catskills, you'll find the town of Hudson, NY. 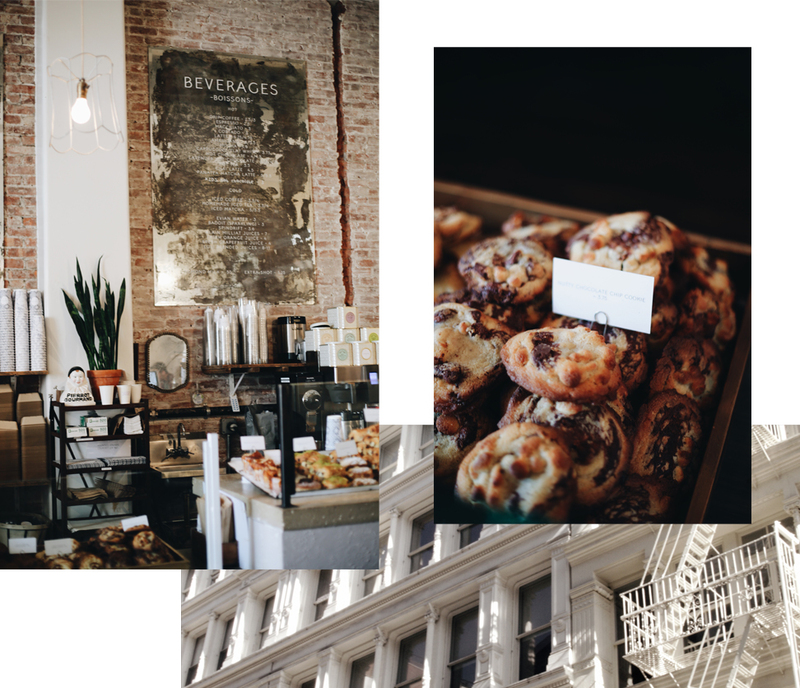 Filled to the brim with gift and design stores, cafes and great places to grab a bite, this is probably my favourite town in Upstate New York. Be sure to check out WM Farmer and Sons for dinner or brunch on weekends. Located just off the highway near the small town of Phoenicia, this diner is my favourite in the world. Serving all the classic dishes but using locally sourced ingredients, Phoenicia really knows how to do a diner brunch. Local theater on Main Street in Hunter showing the latest releases and indie flics, on Main Street in Hunter. A two stage waterfall on the Spruce Creek, if you're headed here make sure to stay on the designated path and in Winter, crampons are a must. Since moving to New York earlier this year, I've more and more been missing the outdoors so having the Catskills and sweet towns in Upstate New York just a few hours drive away makes it all the more easy for a quick escape to the mountains and to be able to hit reset. I'm a big fan of Zipcar, where you can reserve a car from hundreds of locations around the city and pay an hourly or daily rate to hire a range of vehicles. It's simple to use with plenty of cars available and you use a keycard to unlock it, so there's no dealing with long rental car office queues and paperwork of any sort. It's as easy as reserving a car and hitting the road. Heading North, The DeBruce is nestled close by to the town of Livingston Manor and is an easy & beautiful drive just two hours from the city. Part of the Foster Supply Group (which also includes The Arnold House and North Branch Inn which I visited a couple of years back), The DeBruce recently opened in 2017 with 14 guest rooms and is a one-of-a-kind experience. Overlooking the Willowemoc Valley, The DeBruce an inviting and cosy space where you can be sure to park your car and not return to it until you check out. With direct access to 1/2 mile of private river rights for fly fishing and 600 acres of mountain trails as it's backyard, it's the perfect opportunity to explore the surrounding area by hike, cross-country skiing, birding or snowshoeing. Food is an integral part of The DeBruce experience and you're sure to be spoilt. With a cosy downstairs clubhouse where you can sit fireside with a unique cocktail or local brew in hand as well as a glass-windowed dining room with views of the mountains, slowing down and enjoying the flavours of the surrounding land was a memorable part of our stay. For guests, Breakfast and Dinner are included, with Dinner on Saturday an impressive and beautifully presented signature 9-course meal. Executive Chef Aksel Theilkuhl has created a culinary experience which utilises ingredients foraged from surrounding land as well as local suppliers. With the menu always changing and adapting to the availability of produce, you'll be spoilt with fresh, in-season flavours that are uniquely dreamt up. "The DeBruce focuses on conveying a story about its own particular place and time. An experience and emotional memory that lasts in guests’ thoughts long after they have returned home." The building itself is over 100 years old and has truly stood the test of time. What I loved is that the renovations of the entire property keep the original charm and aesthetic of which was once one of 20 boarding houses in the Valley. There's plenty of spots to rug up with a good book and a coffee- from the Great Room which feels like stepping back in time, to the Conservatory, a cosy lounge with an original fieldstone fireplace. There's also a tackle room, where you can gear-up (or off), overlooking the swimming pool which sees's long Summer days. Venturing Upstate has got to be one of my favourite New York memories because being in such a lush and relaxing setting has always been up there as the most dreamy setting to be with friends. As the colder months sneak up on us, nothing sounds better to me than a hot toddy and a crispy Fall afternoon. Thank you to the gorgeous team at The DeBruce for allowing myself & my nearest and dearest the opportunity to rug up and enjoy some incredible food, stunning scenery and the best skillet eggs I've ever tasted.